Amazon customer reviews for the book's first edition: "I took it with me when I gave birth to our daughter and it kept all our info at our fingertips. The medical staff was impressed with how organized I was when they were asking me to fill out paperwork and when they saw my book wished that more mothers would get one!" "I am an organizer junkie, and I LOVED this organizer! It's wonderfully thorough, logically organized, and has more info than you'll ever use! She thought of things I would have NEVER thought of, like what to ask potential pediatricians. All in all, a great resource and well worth the money." "This was the best purchase I made in anticipation of our new baby. I'm a first time mom and would have been lost without this book throughout the pregnancy." "My twins are almost a year old and I still use the book to write down questions for the pediatrician and gifts the kids receive. Not only was it great for preparing for the babies, it will be a wonderful memento later." 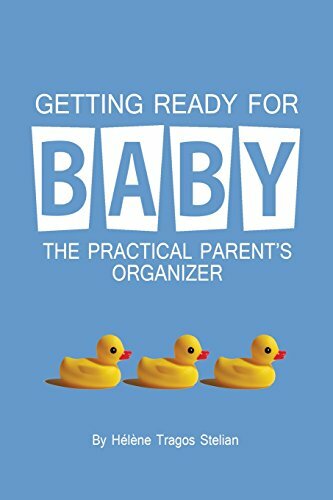 "While preparing for baby can be an uncertain and scary time, this book brings some order and organization to the planning process. I carry this book wherever I go. I would highly recommend this book to anyone expecting." "I loved this organizer because it didn't seem to be too commercialized, it offered just the right amount of things that you would need - as I found out after my baby was born!" "I found this book invaluable! I recommend it to all first time moms and have given it to just about everyone I know that is having a baby for the first time. " While preparing for her first pregnancy, Hélène Tragos Stelian found few useful books to help first-time parents get organized for their baby's arrival. She created charts and checklists of her own to plan for the experience of birth and motherhood, and after lending these forms to countless friends, realized she had the beginnings of a book project. Thus, Getting Ready for Baby was born. Hélène lives in Chicago with her husband Peter and their twin girls Bianca and Indigo.